Architecturally stunning, immensely comfortable and steeped in wonderful history of operatic soirees and grand-style entertaining, The Villa is a unique find among homes of the Sutro Heights/Richmond area. It is set in a prime hillside block lined with mature trees and its street presence is stately, yet inviting. The home is elegant, abundant in light, and updated in a timeless way with close attention to historic detail. It offers views of the ocean and an amazing outdoor space. The back yard is an expanse of soft grass, mature plants and trees, bocce-ball court, and accentuated with a gasline-fed fire-pit. On the main living level you will find a BBQ/herb garden area adjoining the eat-in kitchen and an indoor/outdoor shower – ideal for washing off sand after coming back from the beach. The Villa`s extraordinary kitchen has been featured in Better Homes and Gardens magazine and used in a commercial. It boasts high-end appliances and fixtures including a Thermador double oven (with convection feature), Bosch dishwasher, Perrin & Rowe faucet, whisper close cabinets and drawers, and over an inch thick full slab soapstone counters. There is even a pantry area lovingly referred to as the “Pie Room” as it is ideally suited for baking, replete with white marble counters slightly lowered for rolling dough. The living room has coved vaulted ceilings, wood-burning fireplace, antique sconces, picture moldings, and amazing acoustics. 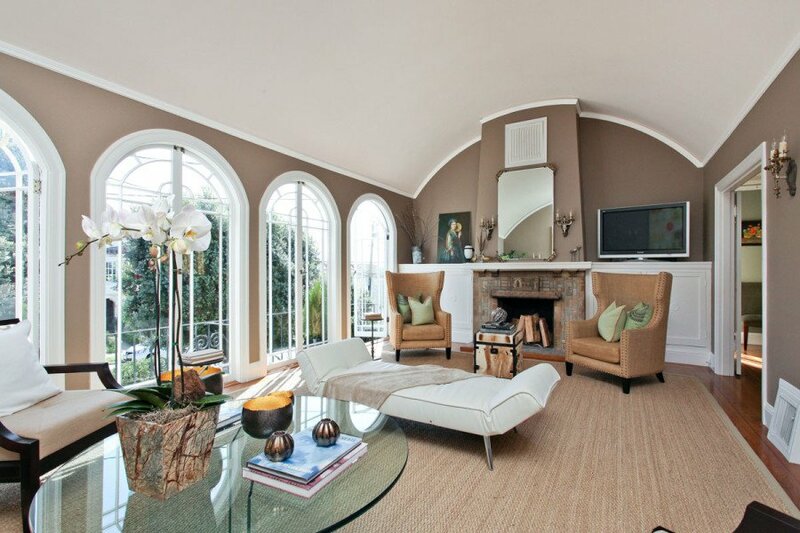 It is an ideal place to entertain, listen to music, or read by the row of tall arched windows. The elegant dining room is home to one of The Villa`s most unique features: the fountain. The sellers have been told that the fountain`s gorgeous mosaic tile is original to the home and was hand-crafted. The dining room will accommodate a large table and easily seats a party of 12. There are three spacious bedrooms and a family room downstairs that includes a bedroom alcove. The top bedroom has stunning 360° degree views that include whitewater views of the ocean, Golden Gate Park and Sutro Tower, and the remaining bedrooms have beautiful sunny outlooks of the garden, as well as the ocean. The family room/bonus bedroom has French doors leading out to the garden. Both of the bathrooms have been artfully remodeled with high-end fixtures and designer marble tile, and the master bath includes heated floors. The second bathroom is connected to the outdoor shower area. The Villa is built on an unusually large lot (35` x 144.5` per tax records) and offers wonderful potential to expand within its existing structure as well as beyond (buyer must verify all expansion potential). The garage area is currently set up to accommodate three cars, includes a wine cellar, home gym, custom potting bench and gardening area, hobbyist woodshop, and massive additional storage. The Sutro Heights/Richmond area is beautiful and friendly with its easy access to the beach, parks and great neighborhood schools and is currently undergoing a district beautification process, including tree plantings and attracting more businesses to the area.